Various information systems assume accurate interaction between humans and the system itself. This demands Ambient Intelligence, where the system accurately perceives the user's situation and intent and provides the needed information and responses. To that end, the system must recognize the user’s status and choose an appropriate course of action based on it, instead of acting unilaterally without regard for the user’s status. ■How will it be used in the future? The recognition of user’s behavior and status will be useful information for designing and controlling interaction strategies between ambient intelligence and human users. Archiving and retrieving past meetings is also important as well as enhancing the effectiveness of telecommunication services. As a critical element in communication scene analysis, we focus on empathy and antipathy among people in face-to-face conversations and are developing mathematical models and automatic techniques for estimating interpersonal emotions from non-verbal behaviors including facial expressions and eye gazes. 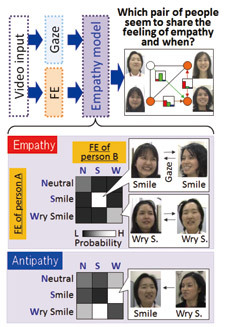 We have proposed a mathematical model that can represent the relationship between empathy/antipathy and behaviors including facial expressions (FEs) and gaze (see right). To cope with the uncertainty of human emotions, empathy and antipathy are represented as probability distributions and estimated by probabilistic inference. 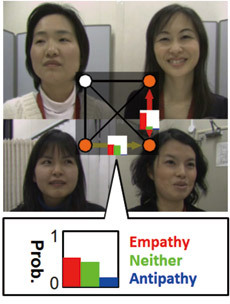 From a communicative point of view, i.e., how emotion is perceived and interpreted by its recipients, this model is based on the distribution of multiple observers’ interpretations of empathy/antipathy in the form of the co-occurrence of the participants’ FEs and gazes (see matrix on right). Participant FEs are automatically classified into such categories as neutral, smile, and wry smile from the movement of facial landmark points and changes in facial appearance. We manually annotated FEs and empathy/antipathy by multiple observers. The figure on the right shows an example of the estimated probabilities of empathy/antipathy. Each bar chart indicates how likely observers are to ascribe empathy/antipathy to the pair. To quantitatively evaluate the results, we proposed an evaluation scheme based on the distribution of multiple human interpretations.